Carbuzzzn: The Game is an exciting new, cool, addictive game for iPhone and Android and is available now! Navigate Carbuzzzn vehicles through a major inner city intersection in an attempt to stop a major accident! The more cars that make it safely through, the more points you get! You can also double your score through rapid boosting triple-taps! Continue to develop your dexterity and steely-eyed focus in the mobile games “Practice Mode” while also getting a chance at a free Buzzz Coin Truck if you’re good enough. Feeling confident of your skills? Purchase Buzzzn Coins, choose a racing team and play to win AWESOME prizes in “Game mode”. At the end of each event, the player with the highest score in their team wins the team prize for that month. Just imagine winning flights and accommodation to the amazing Gold Coast to experience the Carbuzzzn Supercar Driving Experience. Get in the drivers seat, strap in and prepare for some crazy traffic action! LIVIN was founded in honor of a great man Dwayne Lally who like many others took his life after suffering in silence from a mental illness. 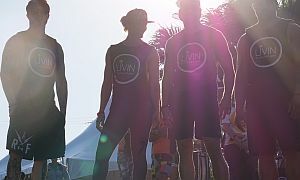 LIVIN is all about living your life at the top and destroying the stigma that is attached to mental illness. Connecting, supporting and encouraging one another to talk about their feelings, issues and problems because "It Ain't Weak to Speak". This is an illness we can beat as long as we unite in love, support and understanding. It's time to make a change and stop this from crippling our society. You are not alone. 1 in 4 people suffer from a mental illness in their lifetime. Let's unite to help our brothers and sisters start LIVIN again. Find out more.